If Edmonton is not at the top of your bucket list, it better be. Toronto and Vancouver? They’re old school. Edmonton, the capital of Alberta, is stepping it up to become Canada’s great next city where you can find all the fun, captivating architecture and landscapes, and indulging food and beverage scene. And you know what makes Edmonton even better? Outdoor markets. This is where you can find not only fresh, local produce but also inspiration, creativity, ingenuity, and spirit of Canadian entrepreneurship. 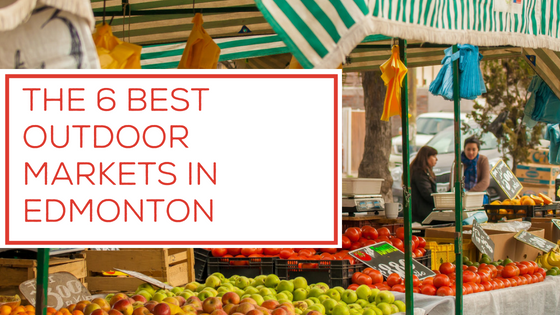 Below is a list of the best outdoor markets to visit in Edmonton. The 124 Grand Market is one of Edmonton’s favourite outdoor markets. You can find everything here — from local produce and food trucks to live entertainment! The 124 Grand Market is owned by Kirsta Franke and is an all-weather, seasonal marketplace featuring 40+ vendors that change weekly. This outdoor market is dog-friendly too! You can find the 124 Grand Market in two locations, two days a week. 124 Grand Market is an all-weather, all-year market that moves to the street for the summer. Learn more here. Established in 2011, the Southwest Edmonton Farmers’ Market has been iconic in bringing bakers, farmers, buskers, tourists, and locals together. Founded to support a community of fun, vibrant, and neighbor-friendly people, the Southwest Edmonton Farmers’ Market prides itself as one of the high-quality outdoor markets in the province. The market is open every Wednesday from May 16 to October 3, 2018. Learn more here. The City Market has been instrumental in bringing together growers, artisans, local farmers, and buyers all year round. This outdoor market has been an integral part of Edmonton’s downtown scene for over a century and attracts thousands of visitors every Saturday. Breads, sweet treats, fruit wines, locally raised meats, fresh farm produce, local art, cut flowers, and handcrafted jewelry are just some of the products you can find in this hip, urban and friendly location. Learn more here. The Old Strathcona Farmers’ Market opens every Saturday with more than 130 vendors ready to welcome you. The largest in Edmonton, this outdoor market is home to handcrafted decors, accessories, clothing, pottery, jewelry, specialty foods, and local farm produce. All products in Old Strathcona Farmers’ Market are made or grown by their respective owners — no re-sales here! The Old Strathcona Farmers’ Market opens at 8 am to 3 pm. Learn more here. Callingwood Farmers’ Market opens up with about 130 stalls each week. Serving the Edmonton community for over 30 years, this outdoor market offers some of the finest farm produce, organic meat, home food, handcrafted decors, art, and accessories in Edmonton. The Callingwood Farmers’ Market is located in a covered courtyard area at Callingwood Shopping Centre. Learn more here. Just a Little Night Market (Night Market Edmonton) is not your usual outdoor market scene. Yes, it’s outside but it’s not a farmer’s market where you can find fresh, local produce. Just a Little Night Market is like a good party where everyone can enjoy artisan food, coffee, crafts, and wares. There’s also some belly dancing, sword swallowing, and magic shows in the venue! A portion of Night Market Edmonton’s profits goes to the Rotary to support their local and international projects. Learn more here. Outdoor markets are great places to find fresh produce, homemade delicacies, and handcrafted art. And Edmonton is home to a lot of them. Make sure to visit these 6 amazing outdoor markets and enjoy all the food, fun, and camaraderie they offer.